ABAP Core Data Services – Introduction (ABAP CDS view) in this detailed introduction is given about the ABAP Core Data services. ABAP Core Data Services – Part 1(ABAP CDS Entities) in this detailed introduction is given about the ABAP CDS Entities. Before, start reading this I would request you to go through above mentioned blog for better and smooth understanding. I, hope you have got the basic understanding about ABAP CDS views. In this blog, we’ll see the different types of CDS views. Define Table Function with Parameters. Defines a CDS view in the ABAP CDS in a CDS source code. A CDS is implemented using a query select_statement. 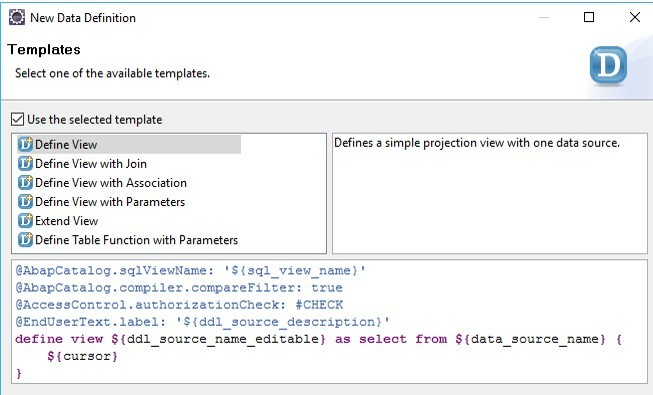 The annotation AbapCatalog.sqlViewName must be specified before the view itself is defined using DEFINE VIEW. 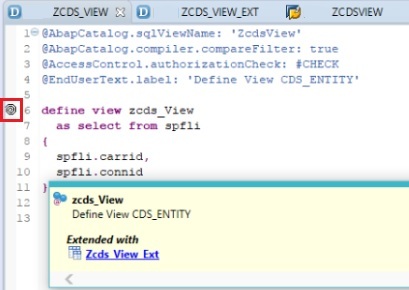 The name CDS_DB_VIEW of the CDS database view must be specified in quotation marks after the annotation @AbapCatalog.sqlViewName. This view is the technical foundation of the CDS view in ABAP Dictionary. The usual rules for ABAP Dictionary views apply to this name and it is not case-sensitive (it is transformed internally into uppercase letters). The associated SQL view is created under this name on the database. The name given to the database view can no longer be changed after the CDS view is transported into a follow-on system. The name cds_entity of the CDS entity is defined after the keywords DEFINE VIEW (DEFINE is optional). No quotation marks need to be specified. This name follows the rules of the CDS database view, but can have 30 characters. The CDS entity represents all properties of the CDS view. Defining a join between two data sources of a CDS view in ABAP CDS.using join expression. A join between two data sources using INNER JOIN or just JOIN selects all entries of the data sources whose fields meet the ON condition. A join between two data sources using LEFT OUTER JOIN selects all entries on the left side. A join between two data sources using RIGHT OUTER JOIN selects all entries on the right side. Entries that meet the ON condition have the same content as in the inner join. In entries that do not meet the ON condition, the elements on the right or left side have the null value that is set to a type-friendly initial value when the CDS view is used in Open SQL. In nested join expressions, the order of the evaluation is specified by the arrangement of the ON conditions. From left to right, the most adjacent ON conditions are assigned to each JOIN and this expression is parenthesized implicitly. These implicit parentheses can be made explicit using actual parentheses, ( ). This is optional. In every join expression, a join condition cond_expr must be specified after ON. When specified, special rules apply to this condition. 1. All relational operators are allowed. the left side of the join. specified for rhs (with the exception of the operator LIKE). Defining an association of the name _assoc in a SELECT statement of a CDS view. An association connects the first elementary data source data_sources pecified as the initial data source (after FROM using the ON condition cond_exp) to the data source data_source specified as the target data source (in the definition of the association). The target data source cannot be built using joins. An association of a SELECT statement can be accessed – in the same statement at all places where this is documented – by specifying the association name in path expressions. When a CDS view is activated with path expressions, the specified associations are converted to join expressions. The initial data source is shown on the left side and the target data source is shown on the right side. The ON condition of the association is added to the ON condition of the join. The type of join depends on the place where the path expression is used. Fields of the initial data source, which are specified in the ON condition, must also be listed in the SELECT list of the current SELECT statement. This ensures that a join expression can be built from the association (when used in a path expression). In the ON condition, the field name should be prefixed by $projection and not by the name of initial data source. The fields of the target data source must be prefixed in the ON condition by the name of the association (prefix assoc. separated by a period). 1. The relational operator IS [NOT] NULL is not allowed. association can be specified for lhs. association or a literal can be specified for rhs. the association must be performed. Defining a parameterized view with $parameters.pname: data type/data element in a SELECT statement of a CDS view. As a developer, you can now parameterize your CDS views. It means you can define one general views which produce context-specific result sets by using parameter values passed at execution time. This means that you do no longer need to create a view for each context! Defines Input parameters pname1,pname2 in a CDS View in ABAP CDS in a comma separated list. Each input parameter must be typed with a data type parameter type. 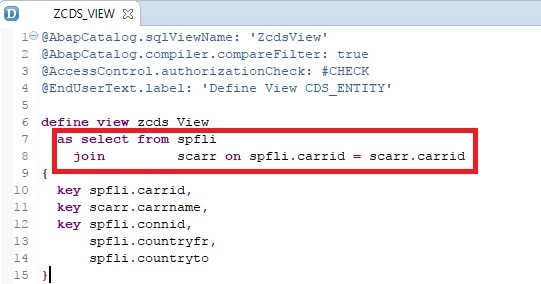 In above shown example, here in zcds_view CDS view carid and conid are used as parameters to get refined result based on filter values given by user at the time of execution. In WHERE clause the parameters are mapped to data source fields used in CDS view. 1. Right side of an expression cond_exp in a WHERE clause or HAVING clause. Note:- The CDS views with parameters are not supported on all SAP certified databases – At least SAP HANA does support it 🙂 . However, the DDL of the ABAP CDS allows creating and accessing CDS views with parameters independent of the database system. Post activation of Define View. b). An SQL view (ZcdsView). The elements of the specified extension list select_list_extension as view fields. Optional associations association1, association2, … for the SELECT statement of the extended CDS view. The annotation AbapCatalog.sqlViewAppendName must be specified before the view extension itself is defined using EXTEND VIEW. In, extend view as shown above Zcds_view_ext is extend CDS view which is used for extension of zcds_view (original cds view) without making any changes to original view. After, activating the Extend view, spiral like symbol comes in original CDS view indicating that this view has been extended using other view as shown in figure 8. As I mentioned above after extending any view using extend view it also adds classical append in SQL view in the ABAP dictionary. 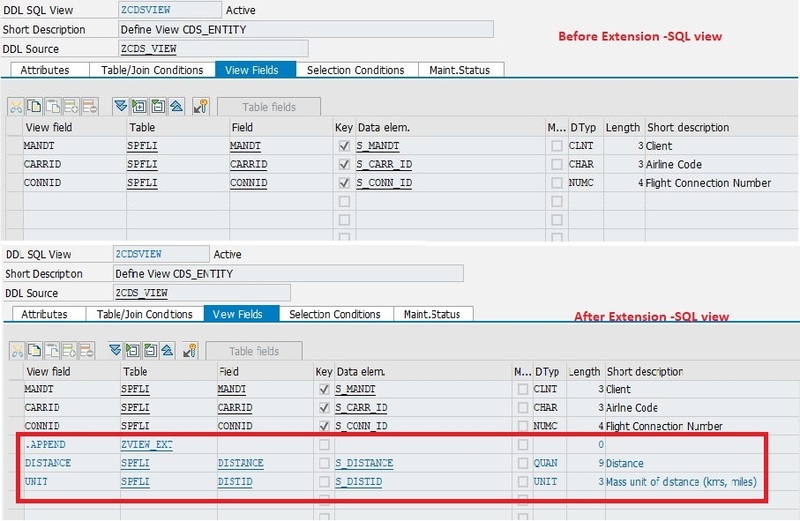 The difference between the SQL view before and after the extension can be seen in figure 9. Figure 9: Comparison of SQL view before and after extending original CDS view. Post activation of Extend View. b). An SQL view (ZView_ext). Views with an explicit name list. Views with aggregate expressions and a GROUP-BY clause. Views with a UNION clause for union sets. The CDS view extensions themselves cannot be extended. Define Table Functions with parameter. A CDS table function is declared as a CDS entity using DEFINE TABLE_FUNCTION. As a data type in ABAP Dictionary, the CDS entity represents a structured type with the elements of the CDS table function as components and can be used like any CDS entity. 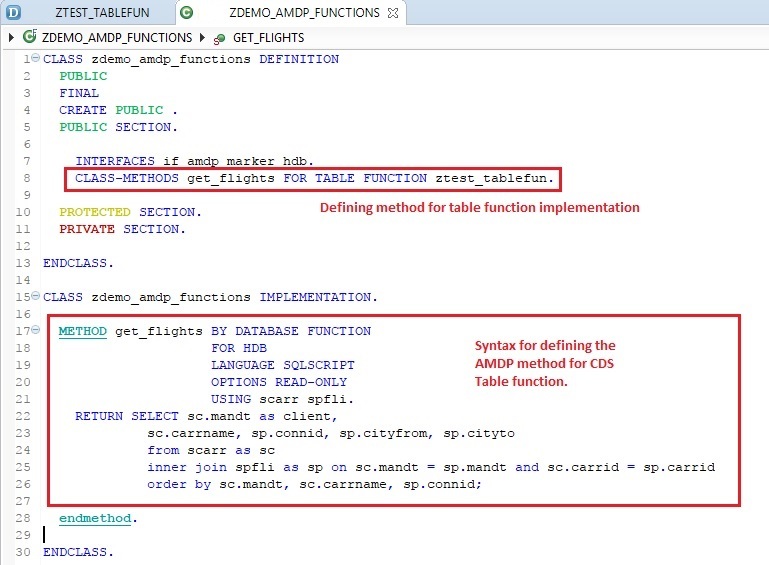 CDS table functions are implemented in Native SQL in an AMDP method and the implementation is managed as an AMDP function by the AMDP framework in the database system. The AMDP method is specified after the addition IMPLEMENTED BY in the definition of the CDS table function using DEFINE TABLE_FUNCTION. It must be declared as a special AMDP function implementation for precisely one CDS table function using the addition FOR TABLE FUNCTION. Figure 10: Example of Table function with parameters. Figure 11: Definition of AMDP function for Table function with parameters. CDS table functions can only be used in a database system that supports AMDP. When a CDS table function is created, the CDS entity must be activated first, before the associated AMDP function implementation is created. When a CDS table function is transported, the CDS entity is first transported as part of the dictionary transport objects and then the AMDP function implementation as part of the ABAP transport objects. Depending on the size of the transport, there can be a considerable delay between these two phases where the CDS table function is not in a usable state. To keep the focus on core objective (Core Data Services) of this blog, I tried to make it as small as possible. Suggestions and questions are welcomed !! 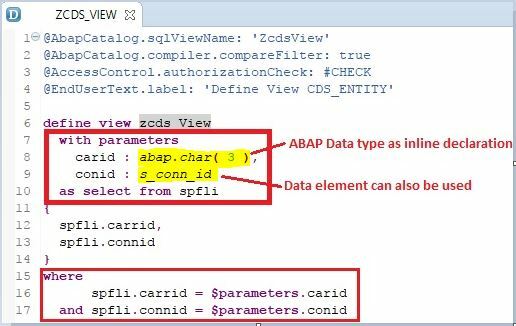 ABAP Core Data Services – Introduction (ABAP CDS Views). ABAP Core Data Services – Part 1 (ABAP CDS Entities). Thanks for the article!! It’s really helpful in understanding the basics from an ABAPer perspective. I have a query here, Do you know how the memory consumption happens when we use very large CDS views( I almost have 15 tables in joins and unions and 330 fields in the output) ? View is working fine, however we have issue with very high memory consumption. Is there any workaround or better way of implementing CDS views where memory consumption and response time can be less ? The memory consumption and about the performance, totally depends which Database you are using like SAP HANA will be much more faster w.r.t any other database.